Our first ever all day workshops will start in Autumn 2018. A collaboration with master mosaic artist Bonnie Fitzgerald! 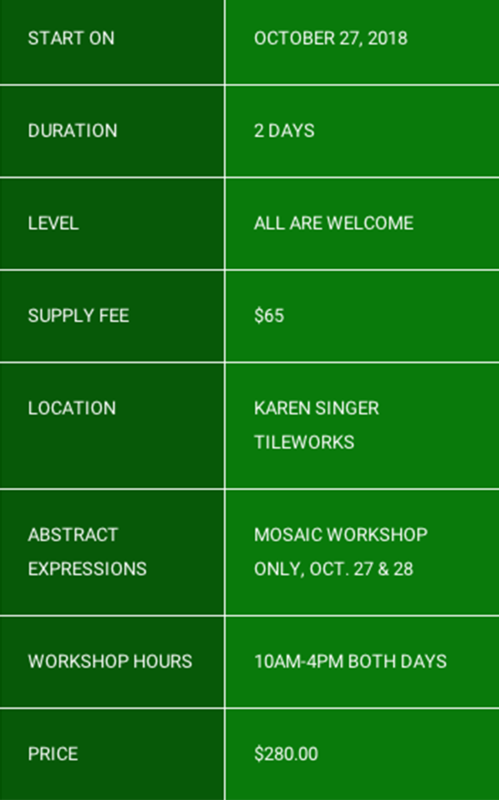 This unique learning opportunity is for anyone interested in creating clay elements, 2 dimensional sculptures or hand built tiles for inclusion in mosaic and mixed media art works. 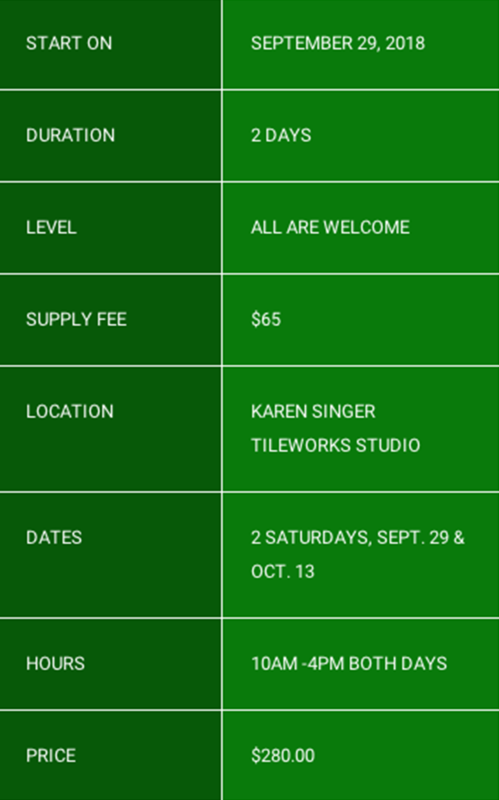 These workshops span 4 days over 3 weekends taught by two masters in clay and mosaic education. Click here to sign up for just one or both! In our first one-day class you will explore the medium of clay in relation to contemporary mosaic making. Clay is a beautifully basic material with endless possibilities for you to bend, mold, carve, sculpt and shape into one of kind, signature materials. You will learn lots of tricks, techniques and technical considerations while having fun working in a professional clay environment. Students will be provided 10 lbs. of clay, white and red, tool loan, tons of cool stamps, letters and more. And access to studio tools and Karen’s collection of stamps, lettering and texture tools. This session will be team-taught by Bonnie and Karen. Your bisque fired elements from day one will be waiting for you. During our second day of learning you will be introduced to a variety surface finishes and enhancements including traditional glazing and non-traditional finishes. The studio is a wonderland of options and Karen a master of beautiful finishes for clay. The second firing and all glazes, oxides and paints included in your workshop fee. Karen will teach this session. Your signature clay elements will be an integral part of your mosaic project. Students are guided through the complete process of creating a mixed media, abstract mosaic, from initial design, preparation of materials, fabrication, and finishing. Works are created by embedding tesserae directly into a setting bed. By building up the setting bed multiple layers of tesserae can be used to create complex visual textures. You will learn lots of tricks to highlight different textures, color combinations and ways to transition between the various materials. Colored thin-set will be our primary adhesive.